Anyway, so yeah, Elizabeth Blackwell! But have you heard of Mary Walker? The Atlantic has an extensive article on Walker's quest to become an official female physician for the Civil War's wounded Union soldiers. An ardent abolitionist and firm believer in women's rights, Walker stated her case in a letter to President Lincoln in 1864. His response: "The Medical Department of the army is an organized system in the hands of men supposed to be learned in that profession and I am sure it would injure the service for me, with strong had, to thrust among them anyone, male or female, against their consent." In other words, a 19th century version of Talk to the hand, you crazy bat. However, Walker wrote in a letter to a friend that she "was confident that the God of justice would not allow the war to end without its developing into a war of liberation." After being turned down in an official capacity by the Secretary of War, Walker found an Indiana hospital that oh-so-graciously allowed her to work, pro bono and sans title. Full disclosure: She was offered the title of nurse, but she turned it down. The head of the hospital offered to share his salary, but she turned it down. The latter is particularly noble/stubborn, since she was cash-poor thanks to " a long divorce with a philandering husband who impregnated at least two patients." Many of her surgical amputees wrote to Walker that she had done a good job and their limbs were functional once again. She designed her own uniform and was recognized by the New York Times ("She carries herself amid the camp with a jaunty air of dignity well calculated to receive the sincere respect of the soldiers"). Sort of like Molly Pitcher, except instead of water it was cutting men's infected legs off, like in that hella grisly hospital-tent scene from Gone With The Wind. NBD! 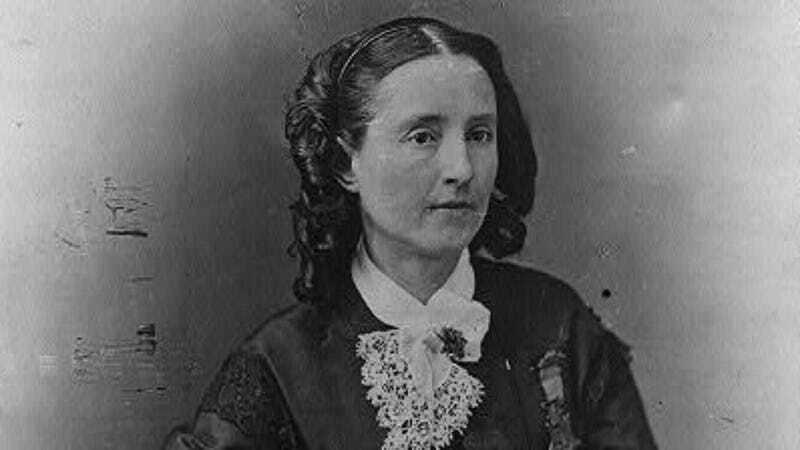 Finally, after becoming a popular figure in modern lore, Walker was formally named the only female assistant surgeon in the U.S. Army during the Civil War. Although she was given the standard uniform, she wrote, "I let my curls grow while I was in the army so that everybody would know that I was a woman." HAM, you guys. In 1864, she was taken to a POW camp by the Confederate Army, where she was possibly raped, starved and kept in unsanitary quarters. Being a Yankee, a fan of abolition AND women's rights didn't exactly endear her to the Confederates. By the time she was traded back to the Union for a male surgeon, she had developed a partial muscular atrophy that never healed, and retired shortly afterwards. And here she is around 1911 in an awesome top hat. Baller.